I haven't had much of an appetite lately which is odd for those who know me. Maybe it's the weather. Today however, I relived the days when Jess used to live here. It's great eating with friends who can go head to head with you. For me, that's usually guys. Jess was the first female I met with the same appetite as mine. It is dangerous though. I definitely gained weight when Jess was here haha. Today I had a lunch meeting with a friend at May's Place. With parts of the menu being 50% off, we feasted for $21 each! Nuts I tell you! You'll understand why that's nuts once I list all that we devoured. - avocado tuna salad (roughage to balance out the starch and seafood). The only casualties were 3 maki pieces, 1 piece of the special roll, and 1/4 of the okonomiyaki. I'm happy to learn about the 50% off menu ($15 min though). There is also a $1 menu as well. Having ate all that, I'm surprised I even finished tonight's dinner with the girls (well, at least those who weren't unfortunately working late) at Madiba but I did. 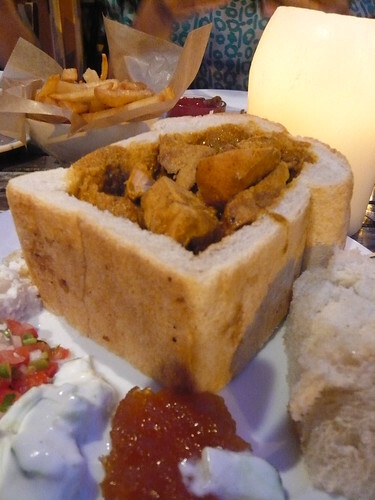 Chicken Durban Bunny Chow, curried chicken in a bread bowl. Interesting way to eat curry but the chicken was dry. We also shared fatcakes and South African cooked veggies, yum and yum! But wait, I'm not done yet. I had the girls over for dessert. 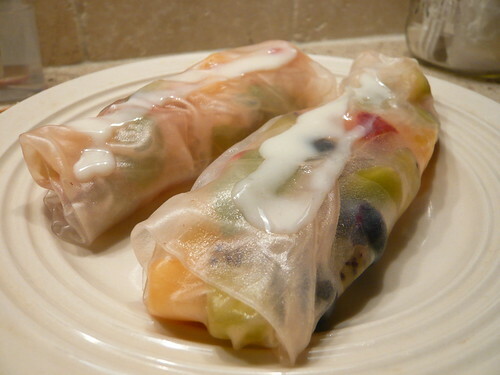 I made fruit spring rolls with strawberries, blueberries, cantaloupe, kiwi, orange, mint and lemon/lime yogurt dipping sauce. The girls liked it enough to ask for the recipe which makes me happy. We had that around 9pm and I'm still full which is rare. I'm usually hungry again an hour or so after I eat. I seriously packed it away today. Haven't done that in a long while.